Growing up, we skipped the pies and got hooked on my mom’s pumpkin cheesecake as our traditional Thanksgiving dessert. But since this blog is Haute Apple Pie and not Haute Apple Cheesecake, I wanted to come up with a version of the classic pumpkin pie that still paid homage to our family favorite. 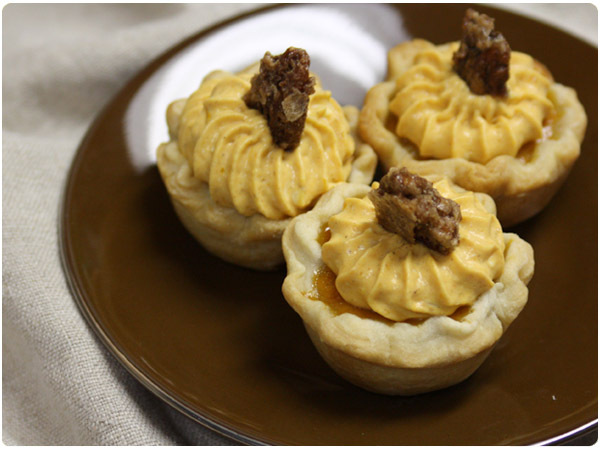 Starting with the traditional pie recipe in a charming mini size, I topped them with a pumpkin “cheesecake” mousse and Stef’s candied pecans. The little twists made them special enough to take home the grand prize at my company’s recent cook-off! While there are several components to this, you can make nearly everything ahead of time. I made my pie crust 3-4 days in advance. The candied pecans can be made up to a week in advance and the pumpkin cheesecake 1-2 days in advance. The grand finale of assembling and baking the pie can even be done the night before, although don’t add the nuts until just before serving to ensure that they stay crunchy. In a large bowl, combine ingredients in order with a whisk. Whisk well to combine. Transfer some of mixture into a glass measuring cup with a pour spout if making mini pies. In a medium bowl, whisk together pudding mix, milk and Cool Whip. Next, whisk in pumpkin and pie spice until well combined. Gradually cut in small chunks of cream cheese, continuing to beat well to incorporate. Transfer to a piping bag during assembly. In a large bowl, combine flour and salt. Separately, combine vinegar and ice water. Cut the shortening into the dry mixture in small chunks using a pastry cutter or fork. Begin adding water to the dry mixture, 1-2 Tbsp at a time as you use the pastry cutter or your hands to work the shortening into the flour. Continue adding water until all the flour is worked in and dough holds together but is not sticky (you may not use all the water). If dough gets too sticky, dust in more flour. To freeze dough, form your dough into a 1″ thick disc and wrap it in plastic wrap and a plastic freezer bag. Move it to the fridge about 24 hours before you’ll be baking your pies to thaw. To use immediately, divide dough into 2 balls and place each ball between 2 sheets of floured waxed or parchment paper. Roll out each ball with a rolling pin until it is flat and thin. Use a large biscuit cutter to cut small circles from the dough and push each circle into a mini muffin pan with your fingers. Crimp edges if desired. For a full size pie, cut dough ingredients in half. Form and roll out one dough ball and transfer to a 9″ pie pan. Preheat oven to 250. Whip egg white, salt and water until frothy. Coat pecans in mixture. In a separate bowl, mix cinnamon and sugar. Shake over pecans and mix with hands to coat. Spread on rimmed baking sheet. Bake at 250 for 1 hour, turning pecans every 15 minutes. Set aside to cool. Preheat oven to 400. Pour pumpkin pie filling mixture into crust(s) using a glass measuring cup for easier pouring. For mini pies, bake about 28 minutes. For large pie, bake 40-45 minutes or until toothpick comes clean. Allow pie to cool completely. Next, transfer cheesecake topping to a pastry bag. 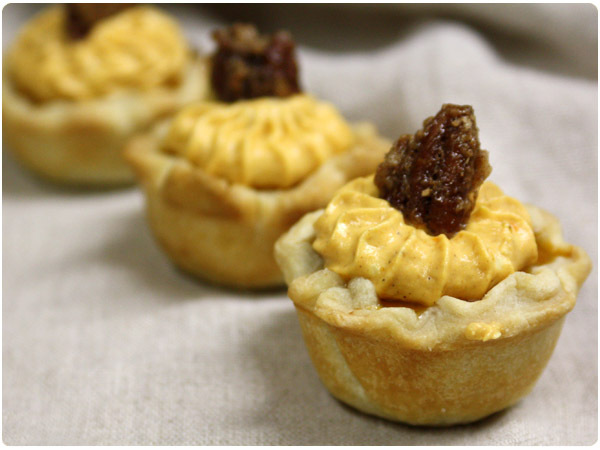 Pipe one dollop onto mini pies or any pattern you like onto a full pie. For full pie, you could also just spread on with a spatula. Top pie with candied pecans before serving. Looking for more Thanksgiving ideas? Check out these great dishes from the Communal Table on Food Network’s The Dish! How much shortening in the crust? I think I might bring these to Thanksgiving. I am in charge of dessert. Thanks for posting a delicious looking dessert. I love pumpkin. Thanks for the catch! I must’ve deleted that by accident when I was editing. It’s about 3/4-1 C. I usually start with 3/4 C and then go by feel. If it’s still really dry, add a little more. If it’s getting too sticky, dust in more flour. 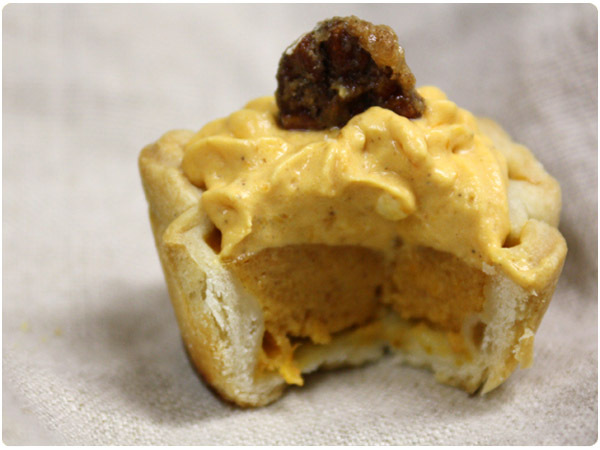 I just made mini pecan pies this weekend, and now I deperately want to try making these mini pumpkin pies. They’re so cute! These are so cute and fun! I really love pumpkin pie and cannot wait to have some on Thanksgiving! I couldn’t decide between pumpkin or pecan pie for this year’s big dinner – this may just be the answer! The idea of mini desserts is so perfect. These are adorable. Are you kidding me? I need a dozen of these -stat! Well done.